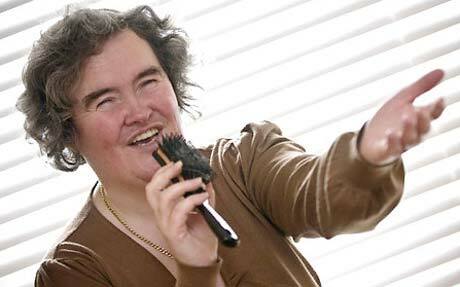 Robin Williams to Play Susan Boyle in Upcoming Biopic? In the wake of Cate Blanchett's role as Bob Dylan in I'm Not There, another cross-gender musician biopic is apparently in the works. This time, however, the pairing is even more unlikely. The rumour mill is buzzing that (sometimes) funny man Robin Williams will be portraying Britain's Got Talent web sensation Susan Boyle. The whole thing began with an interview Williams did with the Telegraph [via the New York Post], in which he said, "I've been asked if I want to play Susan in the movie. I think she's incredible." There's a very good chance he was joking, as the thought of a Britain's Got Talent movie is kind of ludicrous. At the same time, Williams' work in Mrs. Doubtfire suggests he could match Boyle's femininity pretty evenly. UPDATE: Robin Williams has since said the above quote is fake and has denied he will play Boyle in an upcoming film.